Ames Field – Michigan City, Ind. The performance order for the Open Class World Championship Semifinals was determined by averaging the participating corps' highest score at an Open Class tour event earned this week with scores from the event in Avon Lake, Ohio on Saturday, Aug. 3. For the Racine Scouts and Colt Cadets who were not in Avon Lake, and for Gold who was only in Avon Lake, their highest score for the week was used. 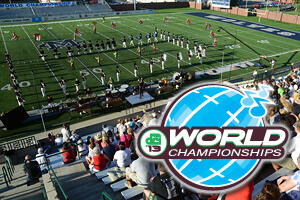 Open Class World Championship Semifinals Ames Field, Michigan City, IN Monday, Aug. 5, 2013 2:00 PM – Gates Open 3:30 PM – Opening Ceremony 4:00 PM – Racine Scouts 4:17 PM – Blue Saints 4:34 PM – Les Stentors 4:51 PM – Taipei Yuehfu 5:08 PM – Colt Cadets 5:25 PM – Raiders 5:42 PM – Legends 5:59 PM – Intermission 6:33 PM – Gold 6:50 PM – 7th Regiment 7:07 PM – Spartans 7:24 PM – Music City 7:41 PM – Genesis 7:58 PM – Vanguard Cadets 8:15 PM – Blue Devils B 8:41 PM – Last Score Announced Central time zone. All times approximate and subject to change. View a complete schedule of World Championship events.